Rambo: The Force of Freedom! The year was 1986. The Cold War was in full effect, hair metal band Poison was starting to make some waves, G.I. Joe was an extremely popular cartoon/toy line, the Reagan/Bush Regime was in its second term, and America LOVED larger-than-life action movies and the heroes that starred in them.Seeing the success of G.I. Joe and the first two entries into the Rambo franchise, First Blood and Rambo: First Blood Part II, someone got smart decided to do a Rambo cartoon. Keep in mind, Rambo is a violent R-rated franchise, but that’s never stopped Hollywood from marketing to kids with games, cartoons, and toys (See Terminator 2: Judgment Day, A Nightmare on Elm Street, Aliens, RoboCop, Predator). But y’see, you can’t have Rambo running around blowing people away with a machine gun and sneaking up behind them and slitting their throats. Not on a Mon-Fri. syndicated cartoon. Some changes had to be made. 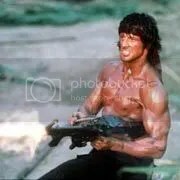 The most striking being that Rambo has pretty much been neutered down to being a pacifist, always preferring to solve problems without the use of a weapon or even a clenched fist. Just like MacGyver! 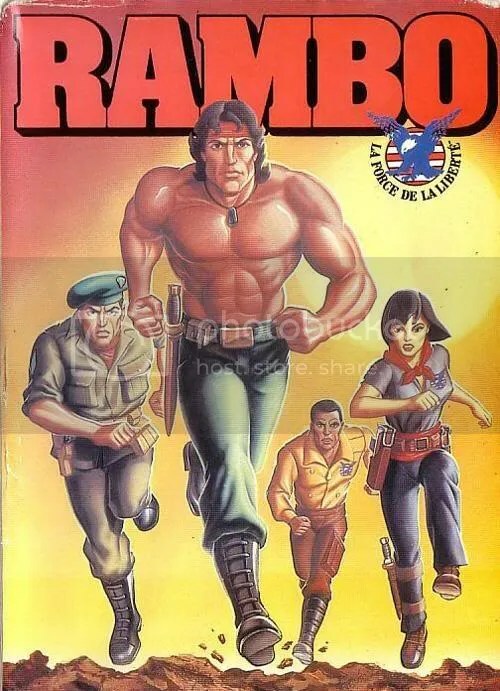 This reinvention of Rambo proved to be controversial, as the usual suspects didn’t like the fact that a Vietnam gung-ho military character was starring in a children’s cartoon and fans of the novel and movies didn’t like that he wasn’t a Vietnam gung-ho military character in the cartoon. But that’s America, you can’t win no matter what you do. Just like ‘nam! This show was obviously going to a G.I. Joe vibe, and although no cartoon can EVER come close to touching what G.I. Joe was, this was still a fun (yet goofy) show. The obvious Cobra replacement here is S.A.V.A.G.E., lead by General Warhawk, whose face and shades look decidedly G.I. Joe-ish. And don’t ask what ‘S.A.V.A.G.E.’ stands for, I couldn’t find it myself. But let’s just say it means ‘Superb Annihilation for Victory Against Greedy Economists’. Anyway, General Warhawk (not to be confused for GI Joe leader General Hawk) commands an elite evil force including: Gripper, Sgt. Havoc, Mad Dog, and middle eastern terrorist (!) Nomad. Fighting for the good is Rambo & The Force of Freedom. It’s not really made clear if the Force of Freedom is an ideal or an actual elite military unit. I say this because there’s only like, Rambo and three other people who make regular enough appearances on the show. During one episode, Colonel Trautman (YES! He made it into the cartoon!) is talking to Rambo after a failed mission in capturing S.A.V.A.G.E., and suggests that Rambo and the “Force of Freedom” take a vacation. Except there’s no one else in the room when he’s talking to Rambo! It’s just funny to me to think of the “Force of Freedom” as not an actual organization, so go with it and don’t leave snarky comments. And besides, is freedom something we should be forcing upon others? Hasn’t Iraq taught us anything?! But hey, if Chuck Norris can have ‘Karate Kommandos’ why can’t Rambo have a ‘Force of Freedom’? Making the most appearances with Rambo is Turbo, the mechanical wiz (voiced by the Big Guy, Uncle Phil—James Avery! ), Kat, a master of disguise, and Colonel Trautman (who also is G.I. Joe-ish, passing for Flint’s twin brother). Trautman had the good fortune of sitting behind a desk and didn’t actually partake in the missions. He showed up at the beginning of the show to give the orders and would show up at the end AFTER the battles had already taken place. There are also some cool ninja brothers in White Dragon and Black Dragon (can you guess who works for the Force and who works for S.A.V.A.G.E?). I’m already tired of typing periods in between ‘SAVAGE’, by the way. And hey, you had to have ninjas in an action cartoon! Storm Shadow and Snake-Eyes are two of the most popular Joe characters and ninjas were all over the place in the 80s. The Dragon brothers made infrequent appearances, and there was also ex-football star T.D. (Touchdown. Get it?) Jones as a member of the Force, but he must’ve always been “on assignment” elsewhere for most of the series. The Force definitely doesn’t give off the scope that it was a huge organization like the Joes were where you could ALWAYS introduce a new character and pretend they’d always been around. 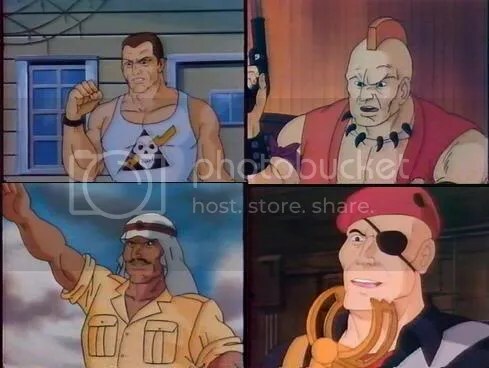 So myself being trained by GI Joe to expect usually a different batch of character each episode, it’s a bit of a letdown to see (besides Rambo) the same one or two characters used over and over again. I do have vague recollections of General Warhawk, although I’m not sure if it’s his action figure or the actual cartoon I remember him from. I never owned any of the toys, but they look poorly designed and cheaply made. I’m sure they weren’t a hit, otherwise this show would’ve lasted longer than one season (it’s all about the toys). Still, this is a pretty good action/adventure show in its own kiddie 80s action show right and was lucky enough to rip the exact same score that the Rambo movies have, definitely adding more weight and atmosphere to whatever action is taking place. Anyway, if you’re a Rambo fan, if you’re Joe fan, if you’re 80s action movie fan, you can’t go wrong with this show. There’s six volumes out and they’re all pretty low priced and feature about 5 hours of Rambo goodness a piece. S.A.V.A.G.E. stands for Secret Army of Vengeance And Global Evil. If you have any questions about Rambo anything, just message me. Rambo & the Force of Freedom is one of my 80’s cartoon series favorites. A may be in a mistake, but i have the memory of having rent a Rambo animated MOVIE or maybe a LONG episode (obviously a VHS tape). Maybe you can help me with that doubt because i couldnt find any info on the net. Thanks. There’s no animated movie. Probably was just a collection of episodes. Maybe it was marketed as “feature length” though. Thank you for your answer. 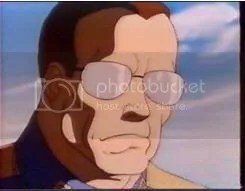 When i make the post i didn’t realize that this picture http://i106.photobucket.com/albums/m276/justking81/Articles/affiche.jpg that you put in your article is the same that appears as cover of the VHS that i told you about. If you look at the simbol of THE FORCE OF FREEDOM it is in spanish (La fuerza de la Libertad) and i’m writing you from Chile (Southamerica). Do you know any detail of this video (name of the episodes included) or from the US equivalent? Thanks and sorry form my “english”. It’s in french but I insist: Is the same one XD, from the suposed “feature length”. Bye. Ruby-Spears produced 65 TV episodes. The overseas version is a set of these original 65 re-packaged as a DVD series. I agree that this show was a blatant GI Joe clone but it was still fun to watch. I would take this show over the crappy cartoons that are on the air nowadays with their bad animation and dialogue and potty humor.